The Mekong River Commission (MRC) was formed on 5 April 1995 by an agreement between the governments of Cambodia, Lao PDR, Thailand and Viet Nam. The four countries signed The Agreement on the Cooperation for the Sustainable Development of the Mekong River Basin and agreed on joint management of their shared water resources and development of the economic potential of the river. The MRC has been built on a foundation of nearly 50 years of knowledge and experience in the region starting from 1957 when it began life as the UN-founded Mekong Committee. In 1996 China and Myanmar became Dialogue Partners of the MRC and the countries now work together within a cooperation framework. The MRC is an international, country-driven river basin organisation that provides the institutional framework to promote regional cooperation in order to implement the 1995 Agreement. The MRC serves its member states by supporting decisions and promoting action on sustainable development and poverty alleviation as a contribution to the UN Millennium Development Goals. 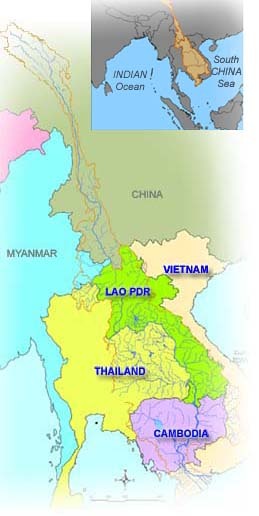 The MRC supports the Mekong Programme, a Regional Cooperation Programme for the Sustainable Development of Water and Related Resources in the Mekong Basin owned by its member countries. Goal 4: To strengthen the Integrated Water Resources Management capacity and knowledge base of the MRC bodies, National Mekong Committees, Line Agencies, and other stakeholders. The Mekong River Commission Secretariat, which is based in Vientiane, Lao PDR, provides technical and administrative services to the MRC Council and Joint Committee. Make a formal submission to the MRC about the 11 hydropower dams proposed on the mainstream Mekong. "The Living Mekong" sheds light on river life.